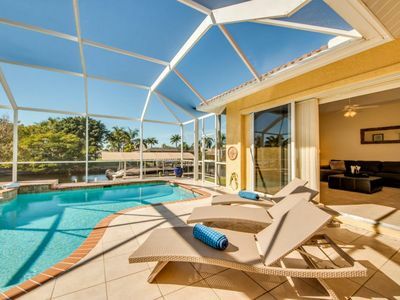 De-stress in your own Private Villa on a pristine salt water canal with heated pool and hot tub. Hello! I’m Danielle, the owner of Villa Savannah and this is why my family and I absolutely love our time at Villa Savannah. Every guest is greeted personally after their arrival. It is our pleasure getting to know our guests and helping them enjoy our villa (we have a spotless 5-star record from all guests!). 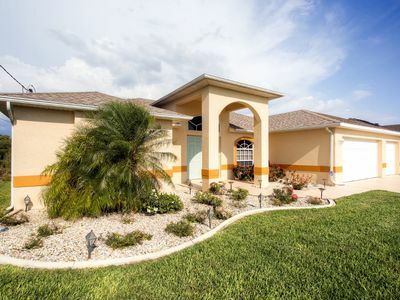 Villa Savannah is a family friendly Villa in the affluent Cape Coral Yacht Club area. 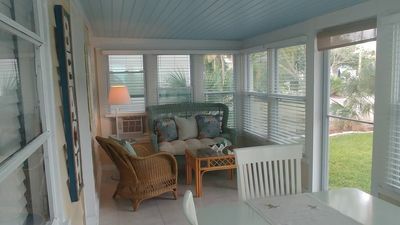 This salt water canal home offers gulf access with only 10 minutes out to open water and Gulf of Mexico. 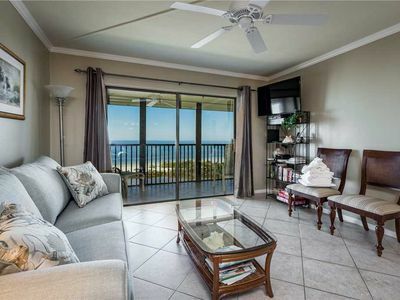 From the moment you arrive, you can enjoy many activities and amenities within minutes of the Villa — like our pristine beaches, championship golf courses, boating on the Gulf of Mexico, jet-skiing, parasailing, snorkeling, kayaking, fishing excursions and a lot more. Just want to relax? No problem….. 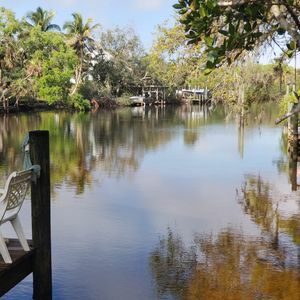 Spending serene days by the pool, in the hot tub, fishing off the dock, watching the dolphins and manatees that frequent our canals or a day at the beach will have you relaxed and refreshed (keep reading!). GOLFING: For golf enthusiasts, there are 5 golf courses all within 15 minutes of the Villa. They are public or semi-private and each one is a bit different from the other, so you'll want to try them all! BOATING: Considering renting a boat? 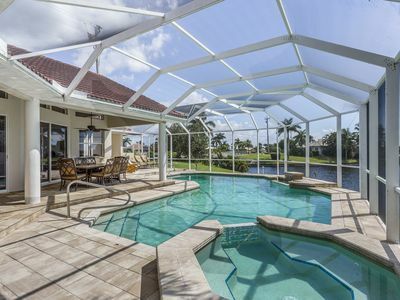 Villa Savannah is 10 minutes out to open water and in Florida, you don’t need a boat license. Boat hire is readily available - the hire companies can deliver the boat directly to the back yard dock, so you can explore the many beautiful islands, restaurants and beaches only accessible from the water. We especially enjoy touring the islands and watching the families of dolphins that we often see in the canals and open water. 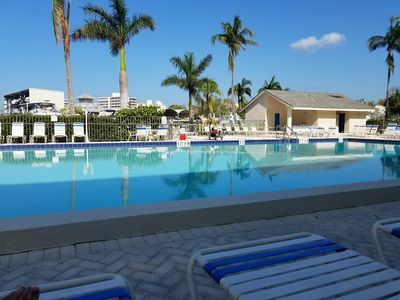 We usually make a day of it and then take the boat to Cape Coral Cayo Costa State Park with over 9 miles of white sand beaches, shelling, nature trails, and bike rentals or tour Picnic Island. At the end of the day, we enjoy dinner or drinks at many restaurants only accessible by water. SHOPPING: Cape Coral area is a shoppers' paradise from designer boutiques in Bell Tower to Miromar Outlets with over 140 designer and brand name stores and Tanger Factory Outlet Mall. There are quirky shops at Cape Harbor so if you boat there for lunch, walk over to their quaint street of shops. We look but seldom buy at these stores as they are a bit pricey. DINING: There are more than 20 restaurants within 5 minutes of the Villa. Our favourites are Lady Lobster which has exceptional Fish & Seafood, Iguana Mia – known for its excellent fresh made Mexican food, Sicily Italian Tratoria, a small restaurant with great ambiance and all fresh from scratch, homemade Italian food and Brewbabies which has excellent French & Continental cuisine (but it’s a little pricey). BIRDER WATCHING & UNIQUE WILDLIFE: Burrowing Owls, Manatees, Dolphins and more. Southwest Florida is home to some unique wildlife and it can be in your yard! 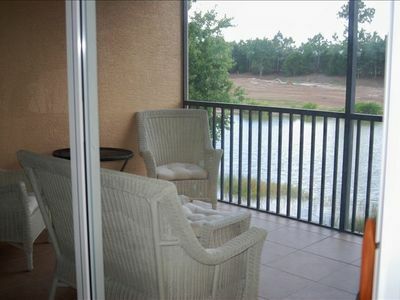 We have seen manatees and dolphins in the canals at our Villa and there are burrowing owls on the block. 5 minutes from the Villa is our Great Florida Birding Trail, Rotary Park which has a rugged trail that is less than one mile long and passes through uplands & salt marshes. Possible wildlife sightings include tortoises, alligators, snakes and a large variety of wading & migratory birds. There is a boardwalk, so it is wheelchair accessible and passes through a mangrove with a broad area of oyster bars & shallow flats that is a good area to view wading birds, especially during low tide. Both trails have observation towers that people can climb to get a bird’s eye view of the area. SAFETY: With 2 daughters, Safety is of utmost importance to us. Cape Coral is the fourth safest city of its size in all of Florida. It is also the safest Florida city for motorists and it was ranked the 6th Best Place to live in the United States by CNN Money Magazine. 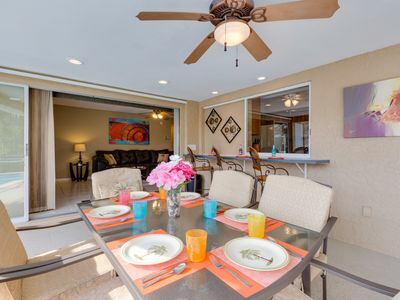 VILLA AMENITIES: Villa Savannah features LED flat screen TV’s in every room and on the Lanai, a large sun deck and huge dock with boat lift. A family-friendly environment, Villa Savannah extends to our little guests Graco Pack N Play (play-pen/portable crib) high chair, and pool/beach toys for your convenience. 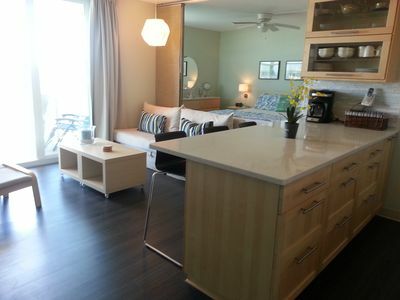 For trips to the fabulous beaches nearby, beach chairs, beach towels and portable coolers are included. 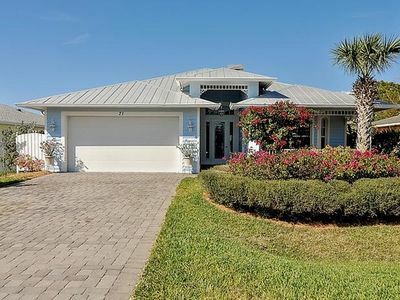 This beautifully manicured and professionally landscaped home, with exquisite Eastern exposure, offers sunshine all day long. 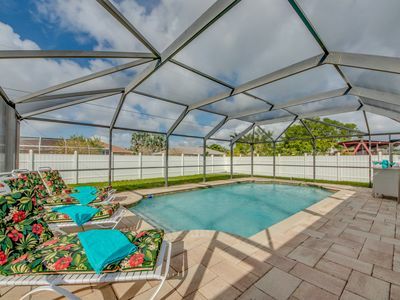 The private screened-in lanai with 40 foot heated pool and covered dining area is perfect for relaxation and entertaining. The pool area/patio includes an outdoor gas BBQ, patio set and poolside loungers. The pool area is visible throughout the house through 3 large sliding glass doors off the dining room, family room and master bedroom. 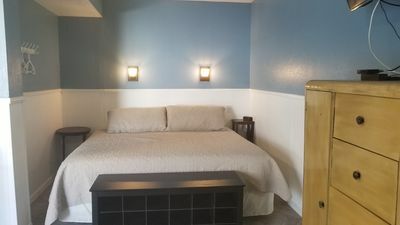 Cozy up with a good book in the separate living room or set up your laptop in the office area with free WiFi and free calls within the USA and Canada. COME AND SEE US! We would love to meet you and host you here at Villa Savannah. Please contact us to book your dates or ask us any questions. We are always happy to help. 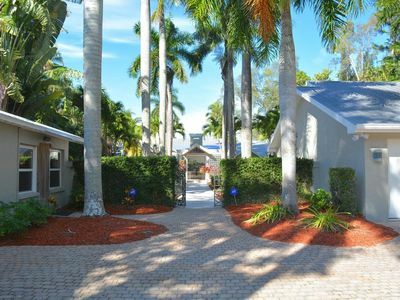 Cape Coral Yacht Club beach is just 5 minutes away with a lovely pier where each morning you will see dolphin families frolicking in the water. 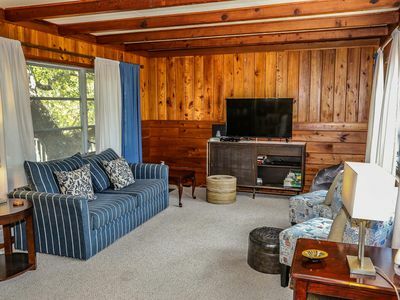 A landscaped beach with playground equipment, BBQ grills, bathrooms and a fishing pier. 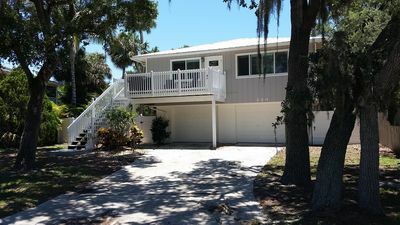 There are also free tennis, racquetball and shuffleboard courts, horseshoe pits, and public boat ramp with access to all amenities at the Yacht Club and free parking. Keep your eyes peeled for the flock of green parakeets that roost there during certain seasons, they won’t steal your lunch, but they are beautiful! 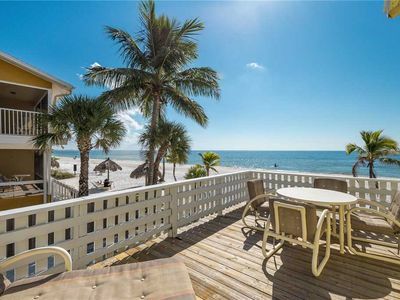 Fort Myers Beach is ~15 minutes from Villa Savannah and boasts miles of white, sandy beaches along the Gulf of Mexico, where the ocean floor slopes gently towards the horizon with no big waves. This beach is the perfect place to engage in watersports such as parasailing, kayaking dolphin eco-tours, jet-skiing, wave-runners or fishing charters – or simply relax and watch the breathtaking sunsets. Sanibel Island Beach is a short drive from the Villa. Sanibel Island is located along the Gulf of Mexico and is known for the amazing shells that can be collected when the tide goes out, luscious dining (seafood, of course! ), fishing, boating, or just plain relaxation, a chance to get away from the hurly-burly and draw closer to nature. 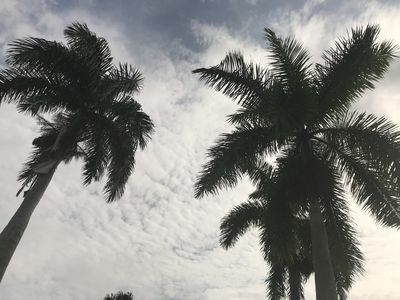 Tucked in the secluded southeast corner of tranquil Sanibel Island there is a six-acre secret garden woven around a beautiful beach-side resort -- home to over 100 types of exotic and unusual flora and fauna. Lovers Key Beach is one of our four barrier islands that make up this state park. A haven for wildlife, the islands and their waters are home to manatees, bottlenose dolphins, roseate spoonbills, marsh rabbits, and bald eagles. The two mile long beach is popular for shelling, swimming, picnicking and sunbathing. 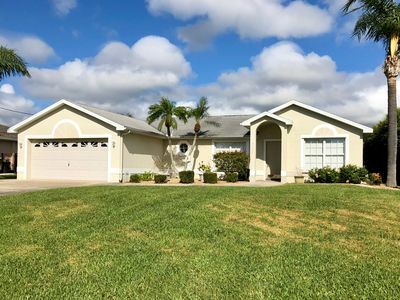 Updated 4BR Cape Coral House w/Private Pool! $5200 month in Vasari C.C. NEW LISTING! 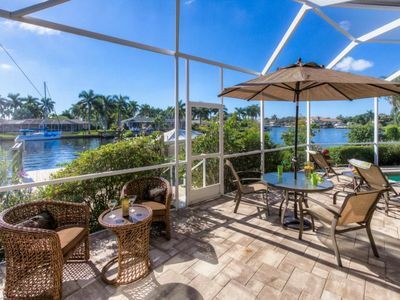 Stunning waterfront home on a canal w/ a dock and private pool!